Samsung Galaxy J3 Android 7.0 Nougat - How to download? Samsung Galaxy J3 Android 7.0 Nougat – How to download? Leave a Comment on Samsung Galaxy J3 Android 7.0 Nougat – How to download? Following various other J series phones like the Galaxy J5 2017, J7 2017, J5 2016, and J7 2016, the Samsung Galaxy J3 SM-J330F is receiving the official Android 7.0 Nougat firmware update. It comes with the latest June 2017 Android security patch level. The Nougat firmware is now available in regions like Russia, UAE, Baltic, Turkey, and many more. Nougat update for J3 comes with firmware build number (baseband) J330FXXU1AQF9. Moreover, the J3 Pro is also receiving the same upgrade. The first variant to receive the OTA update is the Galaxy J3 Pro SM-J330G 2017 Edition. Android 7.0 Nougat is now called Samsung Experience upgrade. The Russian region receives build number J330FXXU1AQF1. How to download Android 7.0 Nougat for Samsung Galaxy J3 with June security patch? You can download the full stock firmware directly from Samsung servers. 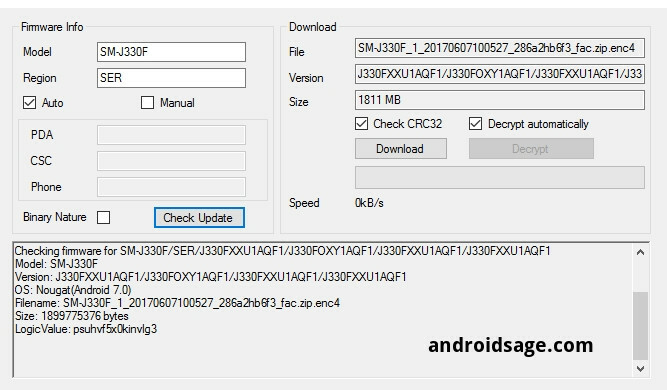 SamFirm tool lets you download full stock firmware for the J3 devices without any restrictions whatsoever. These firmware builds come in .TAR extension flashable via Odin software. The same goes for the J3 Pro version too. In order to install the full firmware visit this tutorial. Unfortunately, the Galaxy J3 2016 SM-J320F variant is still stuck on the previous Android 5.1.1 Lollipop. It will receive an update soon.